Little Common player-manager Russell Eldridge says the football club has ‘a six-game season’ as it seeks to stave off relegation. 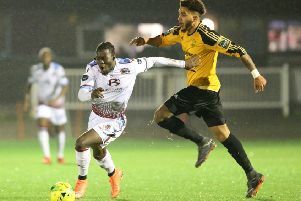 The Commoners are reaching crunch time in their quest to finish outside the Southern Combination League Premier Division’s bottom two, off the back of successive 5-1 defeats. Eldridge said: “We’ve had two tough games in succession, but we have to pick ourselves up. It’s a six-game season now basically and they’re all games we’re capable of getting results out of. Common are fourth-from-bottom of the table - two points above all of the three teams below them, two of whom will face each other tomorrow (Saturday). “We’re going to be optimistic, but it’s very difficult because confidence isn’t the highest at the moment,” continued Eldridge. After three successive games against top four opposition, Common’s remaining matches are all against teams outside the current top seven, starting with a home fixture against 13th-placed Lancing tomorrow. Kick-off at The Oval is 3pm. “In games against teams in and around us we’ve looked a better team when we’ve started positively,” added Eldridge, whose team lost 8-4 away to Lancing at the end of September. “We’ll be looking to try and make a positive start and if we can get ourselves in front, that makes a massive change to us mentally. Common hope to welcome back defenders Ryan Alexander and Lewis Parsons as they seek only a second win since late October. 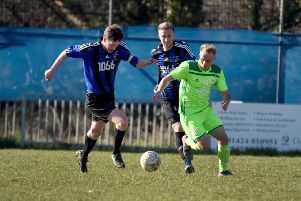 Common will be hoping for a far happier afternoon than last weekend, when they were ultimately well beaten away to table-topping Chichester City. “It was a bit of a tough afternoon and we expected that,” added Eldridge. “The table doesn’t lie and they’re the best team in the league. But we were our own worst enemies at times. “I was a little bit disappointed we gave away the first two goals. It was too much to expect to come back in these situations and the third goal took it beyond our reach. “We were then just looking to get something out of the second half. To get that goal straight away was nice and buoyed us a bit, but one of the most ludicrous decisions I’ve seen cost us the fourth goal. Southern Combination League Premier Division bottom six (played-points): 15 Langney Wanderers 32-33 (-26 goal difference), 16 Loxwood 32-27 (-28), 17 LITTLE COMMON 32-23 (-33), 18 Shoreham 32-21 (-43), 19 Eastbourne United AFC 31-21 (-44), 20 Arundel 32-21 (-45).